Since the wrong patch got uploaded, mind uploading the correct one to dropbox or something similar for those impatient fools who don't want to wait, sometimes the queues can take while. The right patch got uploaded. Only the site's title screen image was wrong. It has since been corrected. This looks awesome! Thank you for all your hard work. I am going to try this out. Lately I am fascinated by the idea of playing purist/correctly translated games of my childhood. Did you ever consider making the title/intro screen literal? Also, would you consider working on Elnard next? Would love someone to re-translate from the original Japanese ROM to retain the original colors, graphics, etc. I like your decision to move the copyright symbol. I think its location on the title screen art was distracting, and this is a good alternate place for it. A bit disappointed by this. I like a lot of Ted Woolsey's silly word choices like the "frostied" and "whacked." I'm sorry to hear that. I had a hard time with it as well. I had to remind myself that Woosleyisms are best left to the script. In repeated system messages, it can feel pretty childish. Nostalgia is inherently selfish. I try to remember that "the needs of the many outweigh the needs of the few, or the one." So with nostaligia, I think it's important to "let the past die. Kill it, if you have to." I had to remind myself that Woosleyisms are best left to the script. In repeated system messages, it can feel pretty childish. It's your project, of course, but I'm not sure I'd agree. I think unusual system messages are a lot more memorable and fun than bland ones you see repeated in lots of games. EarthBound has a lot of weird messages that really stick out, like the "SMAAAASH!" when you get a critical hit or the "You got your head handed to you" message when you get a game over. I actually didn't play Secret of Mana until a few years ago, so it's not really nostalgia that makes me like the "frostied" message. I just thought having a Frosty the Snowman reference in a game where you save Santa was funny. Edit: Just to be clear, overall this hack looks like a big improvement to the original, and I'm excited to play it in the hopefully not-too-distant future. Just figured I'd offer my two cents. If I find any typos while playing, I'll be sure to let you know. I feel like I must be in the minority, in that I was an RPG-obsessed teen in the '90s, so I cut my teeth on Ted Woolsey, who translated several of my favorite games from the era. Yet now when I revisit these games as a nearly forty-year-old adult, I far prefer a more accurate translation. I am nearly 42. I cut my teeth on the same games as you, and I also prefer more accurate translations. I've got a couple big changes coming up for the next update. First and foremost. Relocalized is getting a mixed case name hack courtesy of Regrs. The other thing is a potential improvement with spell descriptions. One of the things I did with Relocalized was to add more flavor to spell descriptions by elaborating on the original Japanese ones. One of the changes I intended to make for World of Balance was to eschew the flavorful descriptions in favor of statistical ones. However, the system that I came up with is pretty space efficient so I have room for some truncated spell descriptions. The descriptions are limited to 43 characters and that's before adding in the statistical info. So these descriptions aren't exactly Shakespeare but they are still loosely based on the original descriptions. Let me know what you guys think about the spell changes and the descriptions. Also, note that these descriptions are for World of Balance which incorporates some major gameplay changes besides outside the scope of Relocalized such as new spells or changes within existing spells. These changes are provided only as examples and will not be incorporated into Relocalized. Diamond Missile: 2 MP, 40 Power. Slice with sharp diamonds. Earthquake: 3 MP, 55 Power. Crush with falling rocks. Slow: 1 MP, Inflicts Slow. Entangle with vines. Stone Saber: 3 MP, Imbues Weapon with Earth & Petrify. Quick: 4 MP, Buffs Accuracy, Evasion, & Charging. Protect: 2 MP, Buffs Defense. Ice Smash: 2 MP, 40 Power. Pummel with ice storms. Acid Storm: 3 MP, 40 Power, Inflicts Poison. Drain: 3 MP, 40 Power, Steals HP. Ice Saber: 3 MP, Imbues Weapon with Water & Freeze. Refresh: 1 MP, Removes Status Effects. Healing Water: 2 MP, 40 Power, Restores HP. Fireball: 2 MP, 40 Power. Sear with balls of fire. Explode: 3 MP, 55 Power. Rock with exploding force. Lava Wave: 3 MP, 40 Power, Debuffs Attack. Flame Saber: 4 MP, Imbues Weapon with Fire & Burn. Fiery Cocktail: 2 MP, 40 Power. Envelope in scalding fire. Blazing Wall: 3 MP, Inflicts Burn. Encircle with flames. Air Blast: 2 MP, 40 Power. Shred with forceful winds. Thunderbolt: 3 MP, 55 Power. Summon powerful lightning. Confuse: 2 MP, Inflicts Confuse. Dazzle and dizzy. Thunder Saber: 3 MP, Imbues Weapon with Wind & Confuse. Balloon: 2 MP, Inflicts Stun. Exhaust awareness. Analyze: 1 MP, Reveals information, Disables traps. Energy Ball: 3 MP, 40 Power, Debuffs Defense. Absorb: 1 MP, 40 Power, Steals MP. Lunacy: 5 MP, Random Effects. Cast curious chaos. Moon Saber: 4 MP, Imbues Weapon with Moon & Steal HP. Half Eclipse: 2 MP, 50% HP. Damage. Transmute vitality. Rush: 4 MP, Buffs Attack & Debuffs Evasion. Sleep Flower: 2 MP, Inflicts Sleep. Lull to slumber. Burst: 8 MP, 100 Power. Blast with secret energy. Manaburn: 10 MP, ? Power, Bypasses Reflect. Revive: 10 MP, Revive allies from Death. Reflect: 6 MP, Spell reflecting Ward. Mana Magic: 1 MP, Restores the Mana Sword. Evil Gate: 2 MP, 40 Power. Unleash waves of darkness. Dark Force: 3 MP, 55 Power. Discharge dark energies. Dispel: 4 MP, Dispels Buffs, Wards & Weapons. Holy Saber: 4 MP, Imbues Weapon with Light & Stun. Saint Beam: 3 MP, 55 Power. Pierce with sacred light. Twinkly Barrier: 4 MP, Attack nullifying Ward. What do you think? Should I replace the existing flavorful descriptions with statistical information and truncated descriptions? If there are no objections over the next few days, I will be incorporating a similar change into the Relocalized so voice your opinion because it matters. I'm definitely a fan of providing the player with useful statistical info, so I say go for it. I dig including spell info in the descriptions, but there is one thing that I find wierd. Earthquake is the correct translation, but... how is dropping boulders on the enemy an earthquake? The screen doesn't even shake. That's one instance where the original localization was probably right to change the name to something more appropriate and descriptive. I think the original localization called it Rock Slide? That's not really much better. Maybe something like 'Rock Crush' would kind of plays off of 'Ice Smash' and maybe make more sense? If I was going to change it, It'd be Earth Crush. I'm not going to because the screen absolutely does shake when you cast the spell. That said, I would like to account for this in the spell description because the focus is definitely on the big ball of earth. I'm currently considering. "Crush with quaking earth." Maybe the rock slide is a side effect of the earthquake? I'm not really sure how you could explain that with such truncated descriptions, though. From the name and description of the spell in Japanese it seems clear that the effect of the spell is that it sets off an earthquake that causes a rockslide. There's simply not enough room to describe the earthquake causing the rockslide. I'm going to leave it as an implied consequence of the earthquake. For me the hack should be left as it is, more adding ruins the original pont of the hack that is only relocalize the game. I disagree. I don't believe that the point of the original hack was to exclusively relocalize them. There were several stated goals of the original hack that included things like censorship. Which is why Death Machine and the original Title Screen were included. Personally, I have no problem adding in minor text related quality of life upgrades for this hack. With that in mind, I'll be submitting an update in a few days. It will include Regrs fabulous lowercase naming hack, some suggestions from this topic, and some suggestions from PMs as well. "Sleep" for example is going back to "Sleep Flower". Recently, I've come across the localizations used in more modern Mana series titles and I'm considering updating Relocalized spells this was but I want to get some opinions. 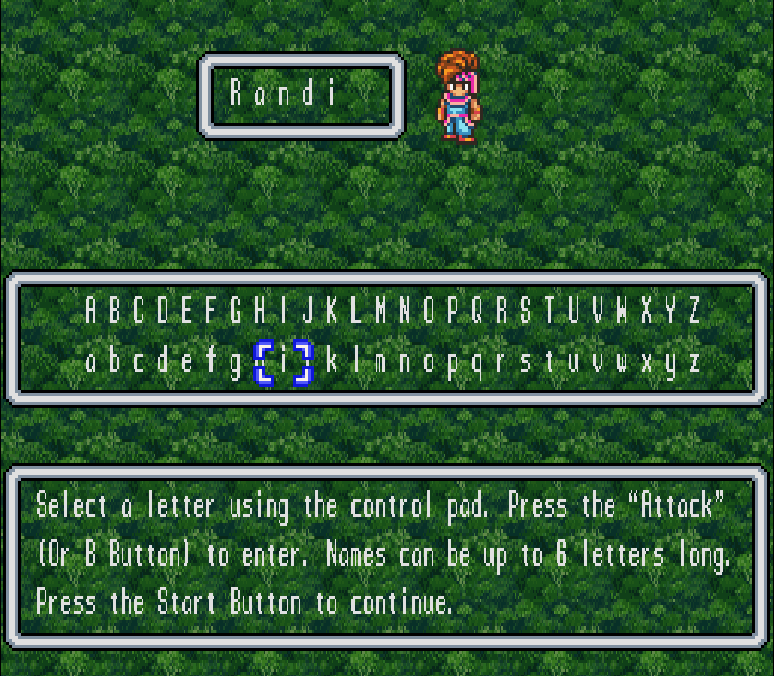 In particular, I really like the way "Children of Mana" localized its spells. That said, unless people are really keen for this change, this is a localization that I'm considering saving for WoB. Evil Gate to Dark Vortex. Note: Evil Gate's Japanese spell description more accurately describes a vortex of darkness rather than a wave of darkness when properly translated. I believe the spell itself is poorly named. Lunar Magic is another one that requires greater explanation. In Japanese it's literally Lunatic which is a noun meaning mentally ill person. I changed this to Lunacy which is a noun meaning the state of being a lunatic. Children of Mana translates this as Lunatique. It's a contraction of the words Lunatic and Technique. Unless there's an overwhelming demand, I plan to stick with Lunacy. The saber spells are another one that Children of Mana updates. "Saber" is removed as a second word in favor of adding "strike" as a contraction. For example "Flame Saber" becomes "Flamestrike". Children of Mana also replaces "Thunderbolt" and "Thunderstrike" with Lightning Bolt" and "Lightningstrike". Even though thunder and lightning are different things when contracted with other words like this their meanings become intertwined. I personally prefer thunder over lightning because of its mythological significance. Also, because I can't seem to let sleeping dogs lie, I'm still trying to tweak the description for Earthquake. Currently, I've got it set as "Crush under falling rocks." Other options include "Crush beneath fallen rock. ", or "Crush under quaked stone." Any combination of these words could work so long as the sentence is 26 characters or less including punctuation. Royal Jam to Honey Brew. This Dawn of Mana update is an item, not a spell. Nice work adding lower case to naming. That is awesome and always bugged me. - Royal Jam has also been called Honey Drink in Seiken Densetsu 3 but was revised to Honey Elixer in Sword of Mana. - Ice Crush might be better as Ice Blast. - Diamond Missile i've seen this translated as Gem Missile but Seiken Densetsu 3 uses Diamond Shards. - Air Blast has been changed to Air Slicer in subsequent games. - Lunacy is a pretty good alternative to Lunatique. - Maybe have a mix of both Sylphid spells. Thunderbolt and Lightning Strike. Also, although I do love classic Mana, it might be worth tweaking elemental names for consistency. I personally prefer the original names but for consistency, it might be worth considering. The Mana Spirits already named as such. Which games feature Air Slicer?